Small Windows PCs definitely seem to be in vogue. Last week we looked at the Hannspree Micro PC, and today we’re looking an (admittedly larger) alternative: the Zotac ZBOX PI320 pico. 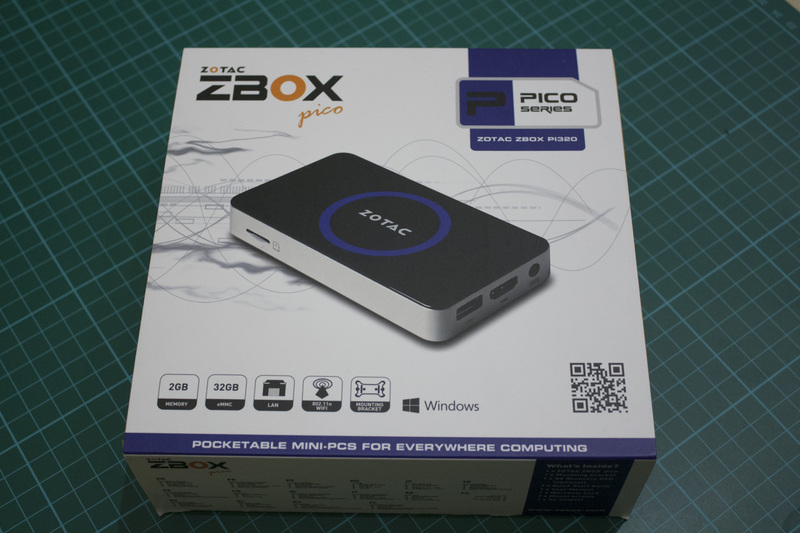 Zotac are something of pioneers in the field of really small but still useful computers, and the Zbox Pico is their smallest effort so far. Let’s see how it stacks up. 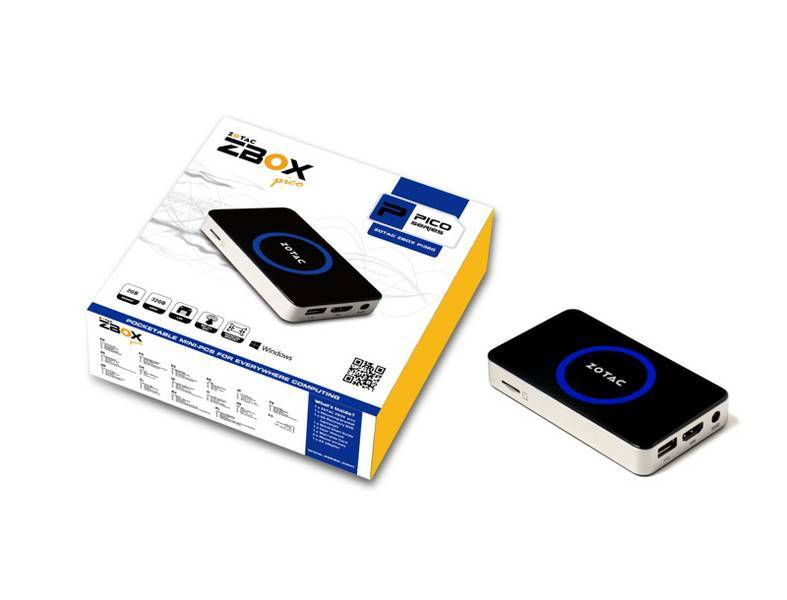 The Zbox pico is a simple slice of shiny black plastic, banded by metal. The top lights up to reveal a Zotac logo and a blue ring when it’s turned on. There are plenty of ports available here; including three full-size USB 2.0 ports, a 100Mb/s ethernet port, a headphone port, an HDMI port and a power input. The bottom of the unit is much the same as the top, except it has a pair of stickers on it. 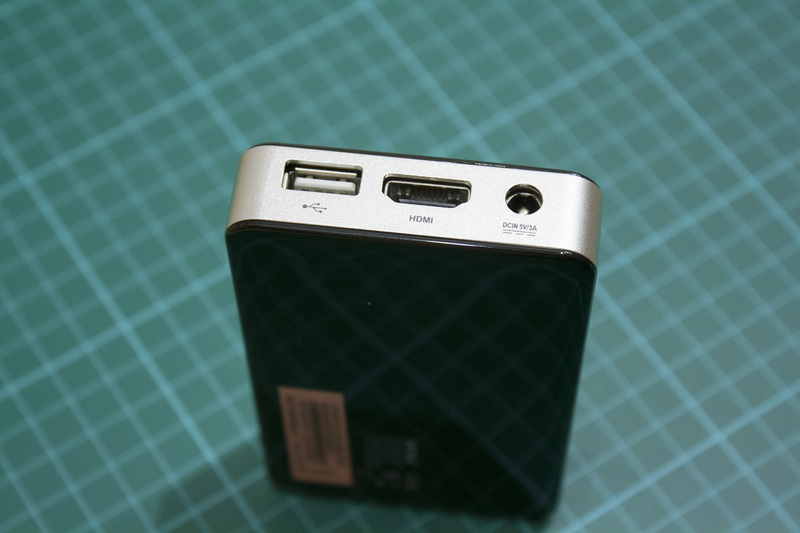 On one side we have a headphone jack, a pair of USB 2.0 ports and a 100Mb/s ethernet port. 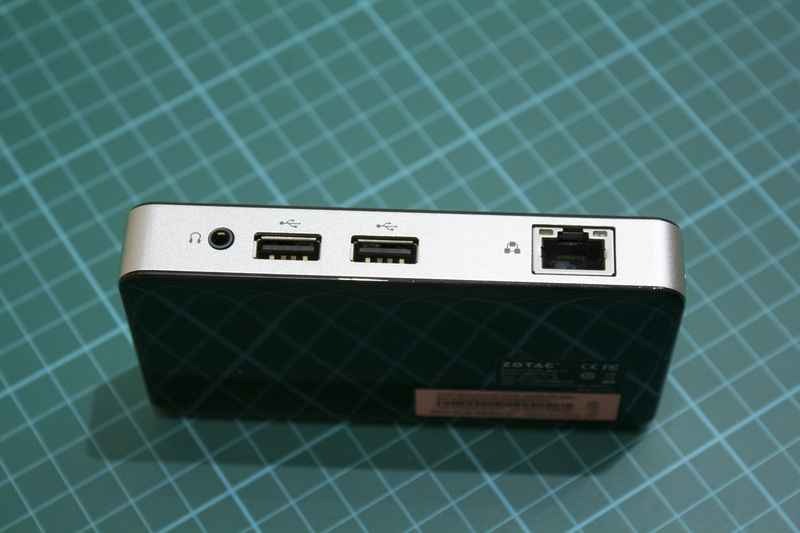 On the next side we have another USB 2.0 port, an HDMI port and the power input (5V / 3A, so outside the reach of USB sadly). 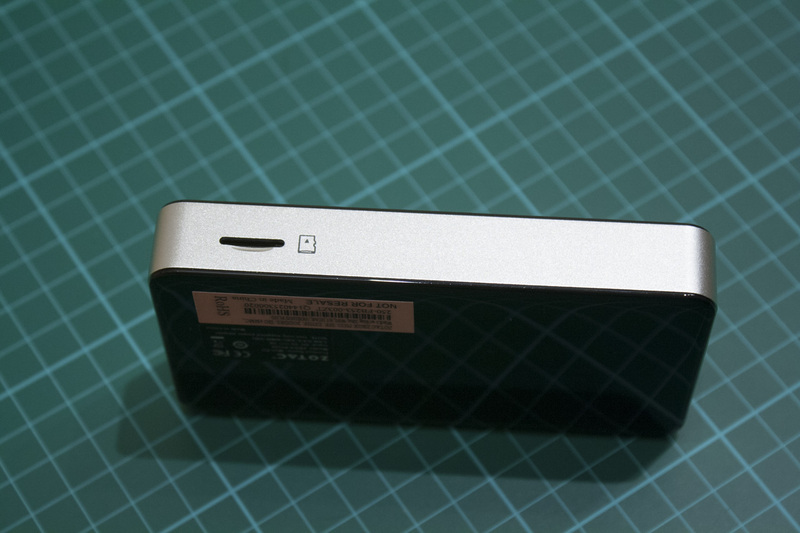 You can see the micro SD card slot from this angle, which is one means of adding storage (the other being USB). 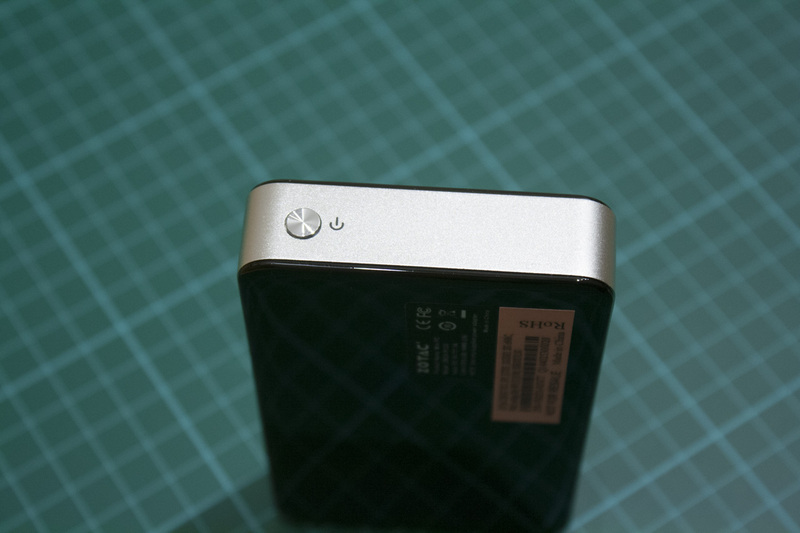 Finally, we have the Sony-style aluminium power button. It’s a pretty good port selection for such a small machine, and notably more than the Hannspree Micro PC we looked at last week (which had only a single USB port, and no ethernet or headphone jacks). It’s traditional to include some photos of the packaging and I’ve taken some, so here we are. The box is a nice whitish colour with a photo of the unit and some sweet monochrome cosmic space fire; below this we have the major specifications. The ports are detailed on the back, along with a pair of diagrams explaining how the pico can be strapped to the back of a TV or placed in the shirt pocket of the shirt you probably aren’t wearing. 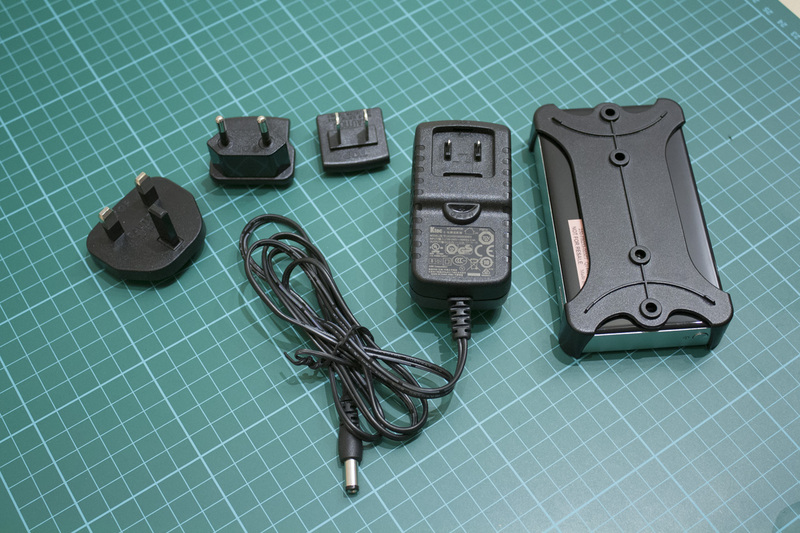 The pico PC comes with a power adapter with a choice of heads (UK, EU or US), plus a VESA mount and the screws to use it. 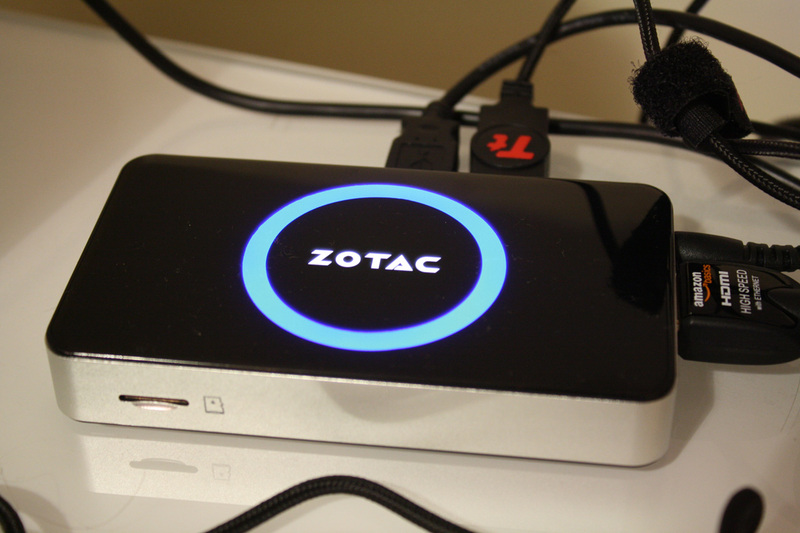 We used the Zotac Zbox pico for a week, testing all the usual things – web browsing, image editing, playing videos and even gaming. The pico was hooked up to a 1080p monitor, a mouse and keyboard. The first order of business was precisely that: business. Could we actually do solid work on this tiny PC, given the appropriate accoutrements? The answer was yes – despite the low-powered Atom processor, the pico PC was able to handle a few Chrome tabs and simple image editing without any issues. Intensive sites such as The Verge induced a bit of delay, but it was certainly possible to juggle a few tabs before the 2GB RAM limit was reached. So far, pretty much the same as the Micro PC, but having the extra ports on tap meant that I could plug in both peripherals without resorting to a USB splitter or Bluetooth, which simplified matters. The pico PC worked silently, although it did get very hot after continued use. Like the Micro PC, there’s no crapware to uninstall, so you save time out of the box and you benefit from pretty rapid boot times (around a minute). The pico PC is certainly designed for media use: playing local files, streaming videos from the web or streaming downloaded media to TVs or other PCs. Despite utilising the same chipset, the pico PC was much better at this than the Hannspree Micro PC, and was capable of everything I threw at it – I’d guess this was down to the thermal advantages of having a bigger cooling area to work with, and therefore the capability to run at higher frequencies for longer. So what did it accomplish? Playing back local videos was no issue, with the pico PC handling 1080p files without missing a beat. Unlike the Micro PC, the pico PC was also able to stream 1080p from YouTube, Netflix and Twitch at full speed as well, which we didn’t expect. Having a headphone port also means that it’s possible to just listen to some music from the Pico, without needing to route through a TV or monitor via HDMI. The pico PC also worked well when streaming a film to our HDTV, which it accomplished without issues over its WiFi N connection. With the capability to add some additional storage via microSD or USB, as well as a wired ethernet connection, the pico PC seems an ideal a low-power media server. Gaming is a bit of a stretch for an Intel Atom PC running Windows, but it’s always well worth trying. Surprisingly, we got worse results with the pico PC than the micro PC, with Counter-Strike failing to load successfully at all. 2D titles remained playable though, including Super Hexagon and FTL. The final test was streaming a game of Counter-Strike over Steam, but this seemed much worse than on the Micro PC – it was playable, but the resolution was very poor and getting kills was near-impossible. Benchmarks are always useful to get a sense of a computer’s power, so we turned to them again here. We successfully performed Geekbench, CrystalDiskMark and Cinebench benchmarks, although we had to use an older version of Cinebench on this 32-bit system. 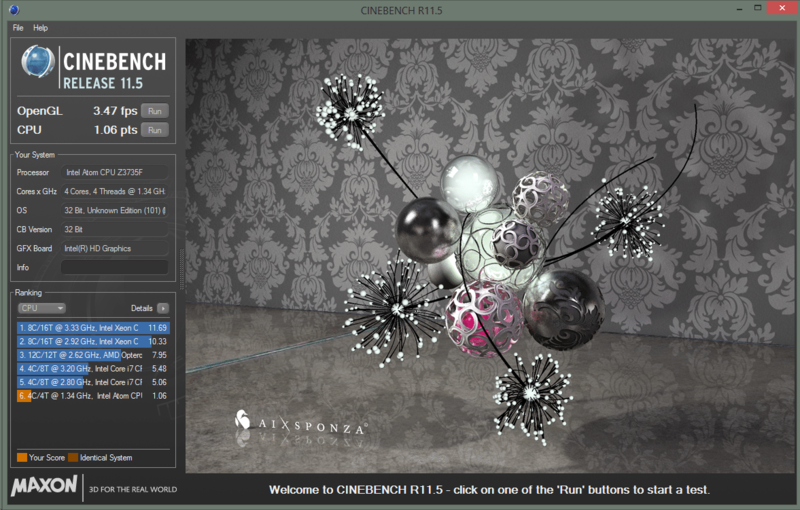 Cinebench is a nice cross-platform benchmark that stresses the CPU and GPU. As mentioned earlier, we’re using the R11.5 release instead of the usual R15 so that we can run the test in 32 bits. Interestingly, we got a worse OpenGL score but a better CPU score than the Micro PC we tested lat week. That could explain why the pico PC was able to handle higher Netflix bitrates but struggled with Counter-Strike. 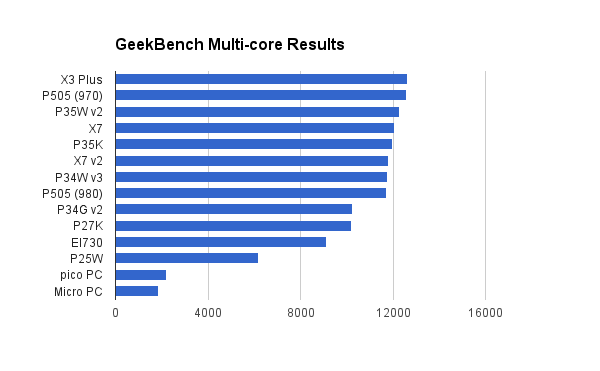 GeekBench is a useful benchmark that examines processor and memory performance. We saw a single-core score of 702 and a multi-core score of 2200; slightly better than the Micro PC but much worse than any laptop or desktop that we’ve tested. 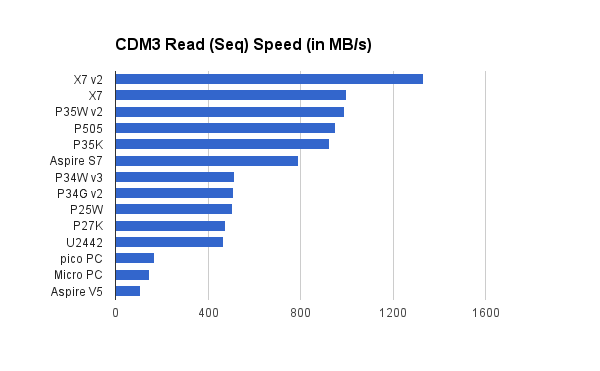 CDM is my go-to benchmark of choice for evaluating storage speed, thanks to its simple interface, rapid testing and good range of chunk sizes. The pico PC performed well here, with the eMMC storage proving faster than that of the Micro PC at pretty much every turn. 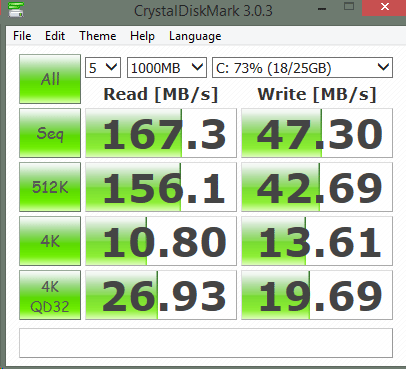 It’s certainly fast enough that storage speed is unlikely to be the system bottleneck, even if it doesn’t approach the 500 MB/s read speeds of a proper solid state drive. The Zotac pico PC is a solid low-cost, small-size PC that is capable of handling media duties and still fits in your shirt pocket. Its larger size compared to the Micro PC allows it to provide more ports and slightly better CPU performance, which is probably worth the extra £20 it costs. Now we’re just waiting for Zotac to stick a gaming PC in the same box, and we’ll be golden!